← You can’t win them all. Deal with it. 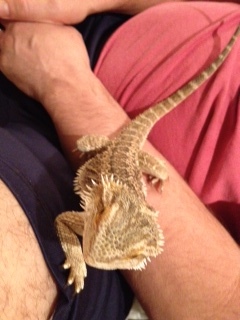 Back in May, my then 9 year-old son, Tyler, used guilt to manipulate Howard and me into adopting a baby bearded dragon. We named him Smiles and I immediately fell in love. My son’s promises of care were quickly forgotten, and Howard and I took up the responsibilities of feeding Smiles and cleaning his tank and paying any general attention to him. (I know, super great parenting. If you need to know more about our awesome technique, you can message me.) The only time Tyler acknowledged Smiles was to take great offense when he overheard me referring to him as mine. I had pretty much accepted my new chores, only half-heartedly resenting them, the same as all the rest. I mean, what was one more thing to add to the list, besides one more thing to add to the list? Still, I didn’t completely give up on Tyler. Each morning, I’d lay out some lettuce and veggie stuff and ‘suggest’ that Tyler feed Smiles. Unfortunately, by the time Tyler finished his breakfast, and realized he hadn’t finished last night’s homework and did something ‘extremely important but only took a second’ on his iTouch, it would be time for the bus. In the afternoons, I’d ‘suggest’ that Tyler pay Smiles a bit of attention. After ‘suggesting’ a few times, Tyler would sigh and walk into the room that housed Smiles tank, look at him for five seconds and say, “Hi, Smiles.” Then go back to the iTouch. I tried not to let any of this get to me. I mean, we allowed ourselves to be suckered into getting the creature. Then, we covered up our parental misstep with another, by not making Tyler take responsibility for his responsibility. This was as much our fault as his. We sucked at being parents and now we were paying for it through our labor. Then came the morning at the bus step, when I saw the game Tyler was so enraptured with for the past few weeks, that he could barely say hello to me, much less Smiles. Handing me his iTouch, he said something like, “Okay, in exactly an hour, you need to…” And then, he went into some complicated instruction while I zoned out, much like he does, I imagine, when I instruct him. It was a game called Dragon Vale. Guess what you do in Dragon Vale? I think you know… Yup, you breed, feed and house little dragons. You need to pay careful attention to these little creatures or they will not grow. Can you stand the irony? Tyler nodded in the way that says, I didn’t hear a word you said you silly adult, don’t you see that I have something extremely important I need to tell you? And immediately, he returned to instructing me. The bus came and left me holding his iTouch displaying a cute cartoon dragon, that you couldn’t actually touch. I looked at him just long enough to close out the screen. Then and there, I vowed to be a better parent and help teach my kids to be more responsible. We would work on it together, putting out one fire at a time. Posted in Every Day Scoops, Uncategorized and tagged bearded dragon, caring for pets, children caring for pets, dragon vale, family responsibilty, irresponsible children, iTouch, teaching, video games, Yeah write. Bookmark the permalink. darn, i was hoping down under was more evolved… but good to know Tyler will have a friend if we come visit. yep, every boy should have a dragon of his very own. My husband wants to get a dog and I’m telling him the only part I want of this idea are the cuddles. I have a feeling he will soon forget that he said I didn’t have to feed or clean up after the dog. Maybe I’ll get a dog-care app so I’m too busy to participate. Your son is brills! When you figure out how to help a kid be responsible for his responsibilities, please let me know. I will worship at your feet and shout your name from the mountain tops (ie Twitter). And bring you ice cream, of course. I can’t believe you have a real dragon. Who does that? 😉 Great post! I have a 4 year old daughter. I’m lucky, at least for now. She does everything I ask her to do. Which isn’t much, admittedly, but she will put things away, for instance. But at 4 they live to help, don’t they? My parenting skills or lack thereof will be put to the test as time goes by. I like that dragon. What a unique pet. love my dragon, although, i never would have guessed it. surprisingly good pets. Oh, I remember having to take care of a Tamagachi, it was a little electronic chicken. One day, I saw it flying through space, which I thought was cute, until I noticed it was the little Tamagachi spirit flying to heaven! This post brought back such fond memories. “Oh, the irony” is right! Wow. This post is spectacular. I didn’t know where you were going but it’s amazing. I love the irony. I absolutely LOVED the ending. Isn’t it amazing when we have those lightbulb parenting moments!? i know, it’s a battle every day. I was so strong with my first, but now.. forgetttabbboutttit!! i just keep trying..
That’s pretty funny. Did he get the real dragon after he started playing the game? 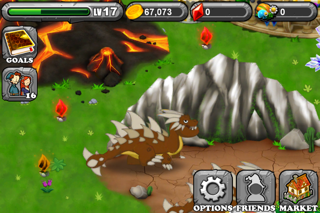 I’ve heard that DragonVale game is really addictive, so don’t start taking care of those dragons too! Oh I love this! My son is totally addicted to Dragon Vale so I know just what you’re talking about. We don’t have a real one though. We got a dog instead (and yes, he’s mine). My husband also really wants a dog, and I very much do not. And I know for sure that I am going to be the one who ends up taking care of it. Isn’t that the way it always it? yes it is!! unless you’re prepared to pick up the poop, don’t do it. dogs are wonderful, but they are forever babies! You’re so right about the irony! I loved the way you tied together two dragons. Way better than slaying them. ha! they are way more adorable than you’d think!! Oh, that is so ironic, and funny! What a weird world we live in now 🙂 I would have gotten suckered into getting the darn thing, too! he was sooo earnest!! i really believed him! never believe a 9 year old!! Wow, that’s so interesting. You seem very good-natured about it all! And lucky Smiles to have such a nice mama. thanks. It’s true, i love smiles. he’s mine. just don’t tell my (irresponsible) kid. Why are things on a screen so much more interesting, automatically, than real things around us? To kids, at least. My son is three and I’m already finding it hard to pry him from the iPad… Sigh. A very funny post… and so sad at the same time. it’s a scary age!! we all rely on them so much – anf not just kids, the ‘big’ kids too. We have a fish that I absolutely did not want and now I am suddenly it’s main caregiver. Makes me crazy. If my son started hanging out with a virtual fish I think I’d lose it completely. Great story! This is hilariously sad. It’s always the parents who end up holding the bag, or in this case the dragon.